Great code, great graphics, great music! 3x thumb up! Could be a bit longer though. Such a lovely demo. With oneframe effects that looks good. I preety much loved the parallax transparencies with the sine scroller, also the vectors are neat (even though I was expecting full blown 3d objects, but the 1 colored cube at the end still makes me content). One of my favorites! The unicorn theme is a bit gay, but the gfx is cool technically, and so are the effects, especially the checkerboard wobbler (seems to be a trend @ BP06), the transparent squares and the innovative way of drawing filled vector. good demo. seems like there are a lot of c64 releases with great code, excellent music and remarkable grafics. the only thing is missing - new content. people got stuck with chess fields, plasmas, tunnels, bump mapping and rotating cubes. i am sure, your mind is capable of more. please, free your imagination from all those cliches. get a look on other art scenes, maybe even not computer oriented, to get a creative impulse. 1. yes, it deserved 4th. Ok, the wobbling checkerboards are cool but I feel like this prod doesn't stand out much from the average ones. Doing oneframed filled vectors on the C64 for the first time ever sure stands out from the average productions. Breaking barriers and doing the "impossible" is what demos were originally all about, all other developments of the concept are sidetracks. On machines with no limits, like modern PC's, this may not be important anymore, but on the C64 it is. And oneframed filled vectors are the only real technical innovation on the C64 so far this year, hence this demo indeed is anything but "average", as it clearly breaks the mould. radiantx: Connections with the scene roots or not, you seem to fail to see my point. I say that I think this demo is average because it's a bit boring to watch, record or no record. radiantx, oneframed, precalculated and monocolor hmmm... I dont want hurt Clarence's pride but giving up colors and realtimeness for 50hz is not my cup of tea. Besides that Cruzer already did years ago a oneframed _glenz_ vector. 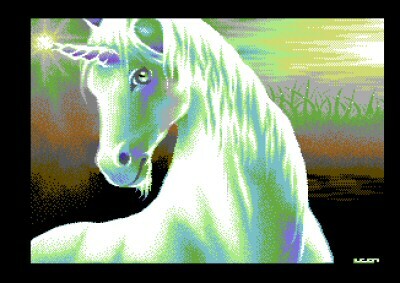 Every imaginable effect can be one framed on c64, it just needs compromises. (cruzer's one being stamp sized and only every 2nd line updated...) I prefer slower effects but done with less crude compromises. I fail to understand why is the 64 scene a sucker for 50hz or border stuff, when more spectacular stuff can be done if we drop the framerate or dont go on the borders. Because 50Hz, full border effects look good while 5Hz letter sized ones don't. Any effect is possible on the C64 if you lower the framerate, even realtime raytracing (at 0.000000000000001 FPS, I'm a bit surprised Samar haven't done it yet). The challenge is making it fast, smooth and good looking. That usually means 50 FPS, as that's when our brain automatically begins interpolating between frames. If the effect can't be implemented in at least a half-decent framerate (25 FPS) then it's better suited for a faster platform. wiki:"hrough experience in the early days of film innovation, it was determined that a frame rate of less than 16 frames per second caused the mind to see flashing images. Audiences still interpret motion at rates as low as ten frames per second or slower (as in a flipbook), but the flicker caused by the shutter of a film projector is distracting below the 16-frame threshold." 50hz is more than enough. "The challenge is making it fast, smooth and good looking." So realtime doesnt counts? Breaking barriers is the easyest with animations or preculcating stuff. Since when is only 50hz == fast smooth and good looking ? If you go to cinema the movie is played at 25-30fps (AFAIK). Have you ever thought its not smooth/fast/good looking coz of that? "full border effects look good while 5Hz letter sized ones don't." an effect will not look good _just coz its on the borders_. Secondly non 50fps or non border doesnt means instant letter size. Anyway its ridiculous to pick out only 50fps effects as breakthrough innovations, only coz they are 50hz. It only shows you dont understand the codings, you only decide upon speed. Firstly, 25 FPS in movies looks smooth because of motion blur creating the illusion of a higher framerate. Read up. Even animated cartoons use this technique for compensating the low framerate. And no, effects don't look good just because they're in the borders. A good looking effect does look better if it's fullscreen, though. 320x200 looks rather small on the C64 IMO, since it only utilizes about half of the available screen area. As for that last paragraph, you're putting words in my mouth as well as claiming I lack knowledge (because disagreeing with you must mean I haven't understood the topic, right). 50 FPS filled vectors are a world first on the C64, that's all I said (I don't consider cheating by drawing very small vectors and only rendering every second line a valid method, no). That thing about "picking out only 50 Hz effects because they're 50 Hz" was a figment of your imagination. motion blur??? a cinema beamer sends the light through the film to lit up the projector. then it shuts the light down for the time when a new film frame is moved infront of the light source. Where does the motion blur come from in this process? You have a series of pictures here with short blank periods between them, no way 2 or more consecutive frame will blur excpet in your brains, but if it blurs in your brain why does an anim displayed on TV not ? "50 FPS filled vectors are a world first on the C64, that's all I said (I don't consider cheating by drawing very small vectors and only rendering every second line a valid method, no)." but it is not cheating if you precalculate all vector data, and display only 2 colors? It's pointless to argue, if you play with your own rules. Cruzer's glenz vektor has more coding tricks, and is closer codewise to a true filled vektor than this one, but you decided this one is not cheating. So eventho being 2nd its 1st. LOL. Do you have any idea at all how is this one done, and the one in YKTR? this is only YOURr personal world first 50fps filledvector. ..and that depends on the effect. Here's my take on it... 50hz filled vector on C64 has been done a long time ago. The first one that springs to mind is the animated one in Century's part for Demo of the year 1990. This might be the one Optimus was thinking about. The first realtime one I can think of is Slammer's stencil vector in Produkthandler (1992)where the framemeter sometimes hits "each". And then there's of cuz my "Cyber Vector" from Camel Park (1994). So Clarence's routine is not the first, but it's the first time in this resolution and size, and I think it's a pretty impressive effect. It's fast, hires and big, but of course lacks details and colors. Personally I prefer effects like this - I mean we have had plenty of 2nd/3rd/etc. effects on C64 in the last 10-15 years. What I would like to see now is some 50hz versions of these effects. And of course you'll have to make some compromises to achieve this, but that's just the name of the game, and if you're a skilled coder you can make the effect look good even with compromises. But of course slow and advanced effects can be impressive too. As long as a routine somehow pushes the limits, it has its place. And btw Oswald: I think radiantx means that each frame of a movie has been PRE-motion blurred already while shooting the film. E.g. if a car speeds by a stationary camera, you can see the motion blur if you freeze the movie. We agree on that. Clarence's FX is not the first but its the best one so far in this league. The 50hz debate is a matter of taste. Rather dont start another argue on it. I rather see a more interesting but slower effect. I dont get a hard on at all if I see an already done effect with hard compromises just for having it running in 50hz. I prefer a good tradeoff between detail and speed. A matter of taste indeed. My taste is that I'd rather see some faster and not too compromised effects. The way to get fast effects should be by using clever coding tricks, and not just by making hard compromises. Lovely checkerboard and parallax boxes. Ok with the oneframe 1 color cube..
Great demo with awesome music! Diagonal chessboard and translucent squares look nice. rulez added on the 2013-07-27 16:21:12 by w00t! page created in 0.017314 seconds with 15 queries.